My son seems to really like BerryDophilus 2 Billion, Natural Berry Flavor by NOW chewable probiotics. He likes the fun little animals that they come in too. 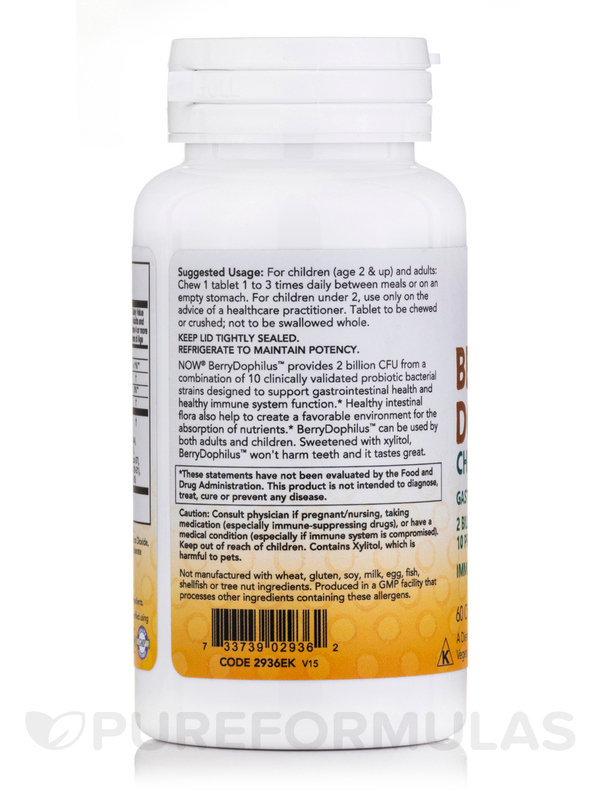 NOW® BerryDophilus™ provides 2 Billion CFU from a combination of 10 clinically validated probiotic bacterial strains designed to support gastrointestinal health and healthy immune system function. Healthy intestinal flora also helps to create a favorable environment for the absorption of nutrients. 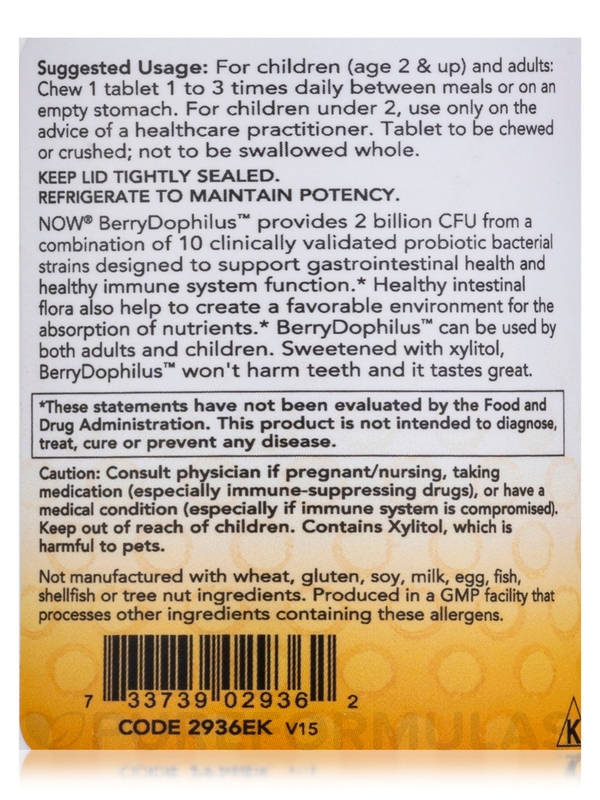 BerryDophilus™ can be used by both adults and children. Sweetened with Xylitol‚ BerryDophilus™ won't harm teeth and it tastes great. Amount Per Serving / % DV for Children Under 4 yrs. / % DV for Children Over 4 yrs. Lactobacillus acidophilus (La-14)‚ Bifidobacterium lactis (Bl-04)‚ Lactobacillus plantarum (Lp-115)‚ Bifidobacterium longum (Bl-05)‚ Lactobacillus rhamnosus (Lr-32)‚ Streptococcus thermophilus (St-21)‚ Lactobacillus paracasei (Lpc-37)‚ Bifidobacterium breve (Bb-03)‚ Lactobacillus salivarius (Ls-33)‚ Lactobacillus casei (Lc-11). Other Ingredients: Xylitol‚ sorbitol‚ cellulose‚ stearic acid (vegetable source)‚ silica‚ malic acid‚ natural berry flavors‚ beet powder and FOS (fructooligosaccharides). 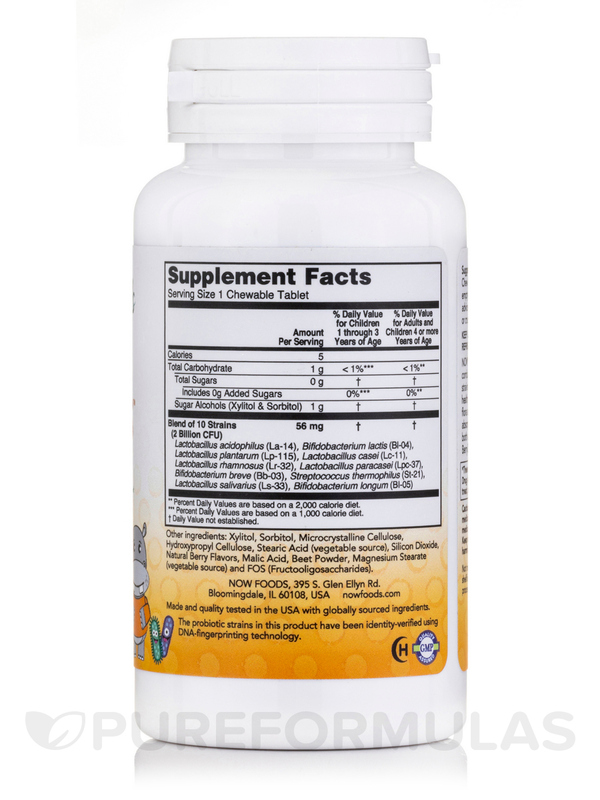 For children (age 2 & up) and adults: Chew 1 tablet 1 to 3 times daily between meals or on an empty stomach. For children under 2‚ use only on the advice of a healthcare practitioner. 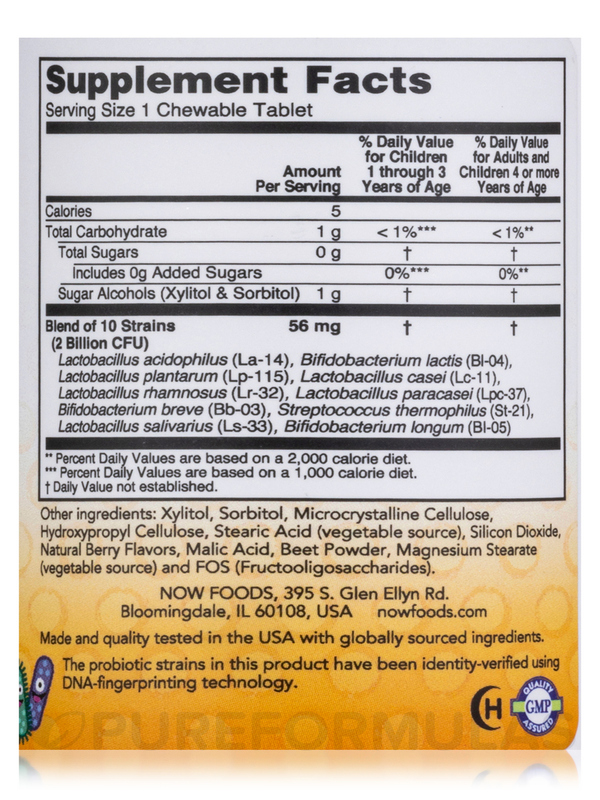 BerryDophilus 2 Billion, Natural Berry Flavor by NOW are awesome probiotics! My kids love them so much! They even remind me to get them out in the morning. The taste is great and the fun animal shapes makes it that much more appealing for kiddos to take them. Win! It is a very fair price. Been taking BerryDophilus 2 Billion, Natural Berry Flavor by NOW for about a year. My son and I each take one every morning before we eat. You are supposed to take probiotics on an empty stomach. I'm pretty picky with what vitamins or medicine tastes like, and these don't bother me at all. My son takes them with no problem. You can take more than one a day, but I have yet to try that. PureFormulas has the best price ever, for this product. Not enough in one bottle when more than one person takes it a day (it only lasts one month for us). 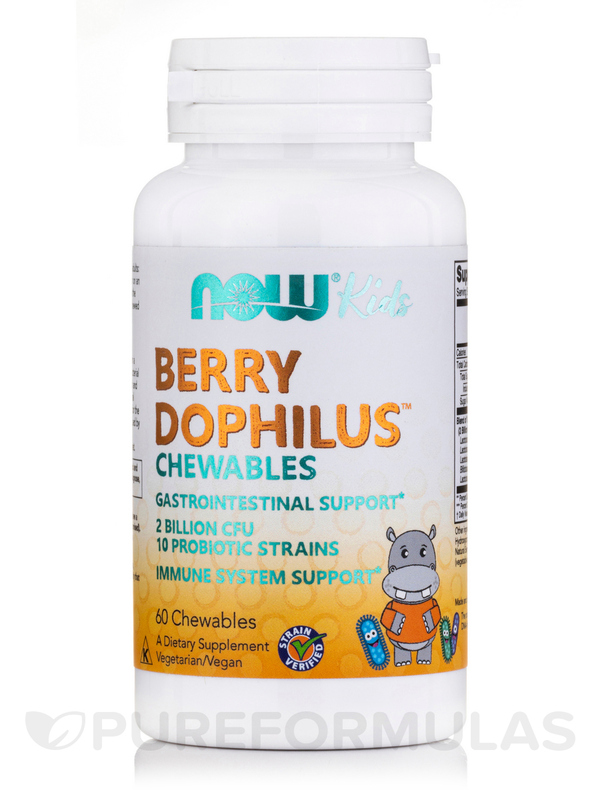 My kids love BerryDophilus by NOW Foods. They love getting them out of the fridge and choosing the animal they are going to eat for each day. I have trouble getting my kids to eat them.